I’ve fallen into the self-made trap of considering so many great and timely topics for History as Prologue that’s I’ve neglected the actual posting of content. I’m comforted no so much that many other bloggers share this fault, but by the knowledge that it can be quickly corrected with a little diligence on my part. More about that last item* in a moment. 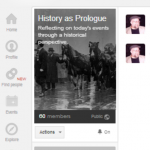 There’s no denying that, among other neglected matters, History as Prologue has a supporting array of social media platforms that haven’t been tended to properly. Again, that’s easily corrected. If you’ve not heard much about Google+, (Google Plus), or what you’ve heard is dismissive despite recent news that the this social layer of the planet’s largest search engine company just exceeded Twitter in numbers of active users, then I highly recommend you jump in with both feat to this amazing community. For those who already know the value of Google+, and for those about to enjoy the experience, Google+ has entire communities for special interests. History as Prologue is one such community. Please join this community and if you mention this post, you could win a gazillion dollars – OK, not from History as Prologue or me, but I guess it could happen, theoretically. We have a Facebook page, the last word having been shortened to accommodate FB length requirements. 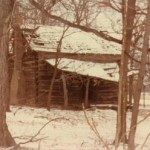 Please like and follow History as Prologue. We even have a Twitter account, @HistoryasProlog. Tweet much? If so, please follow us as there are a growing number of other great history-related sites and authorities followed by History as Prologue. From my perspective, every good blog should have a worthy cause it champions. For History as Prologue, this cause will be advocacy for unemployed, hard-to-employ, and underemployed veterans. 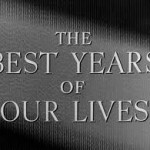 The name under which this campaign will be known is The Best Years of Their Lives. 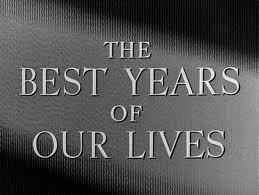 The title, of course, honors the 1946 Best Picture Academy Award Winner, The Best Years of Our Lives, directed by the great William Wilder. If you’ve not seen this sobering portrayal of WW II veterans readjusting to civilian life, you simply must. The launch date for this effort will be on May 25, the one year anniversary of History as Prologue. Please watch for posts and other information about this cause. For those who’ve interacted by commenting on History as Prologue or through social media and mail, thank you for the kind encouragement, and most often, valuable information you’ve shared regarding our common love, American History. While longer posts on major topics will continue, I’m committed to sharing the day-to-day moments when history makes clear the present. Finally, I hope we’ll all become active on this blog as we also share those many ways in which history touches our lives in ways meaningful to us on a personal level. The joy of a good book, the viewing of a good – or not-so-good – movie, as well as the day trip to some historic site or museum, big or small, are all topics worth sharing with fellow lovers of American History.